Offices need to help in the fight against the ever mounting problem of e-waste, one the most under-recycled and fastest growing form of rubbish in the EU. Electronic waste, or e-waste, is causing a major waste management headache in the developed world. Despite the mountain of discarded monitors, hard drives, circuit boards and printers rising fast – a side-effect of our disposal culture – the efforts to control the waste have been slow to non-existent. Of the 100 million tonnes of e-waste produced across Europe, only a quarter of medium-sized electronics are collected for reuse or salvage, whilst smaller appliances such as MP3 players are abandoned altogether. European Union efforts to control the problem appeared in 2007 in the form of legislation covering waste, electrical and electronic equipment (WEEE). One stipulation of the new regulations dictates that companies must have proof that their WEEE was given to a waste management company and afforded environmentally sound treatment and disposal. E-waste is such a problematic form of rubbish because it typically contains a complex mixture of materials, such as plastic, glass, electronic boards and a variety of metals. It is also effectively a hazardous waste because it can contain toxic substances such as lead. As such it requires specialist handling and should on no account be disposed with everyday waste. In order to comply with the WEEE regulations there are now several options for organisations considering how to dispose of their e-waste. The electronics could be returned to the manufacture, taken to a professional waste disposal facility or donated to a non-profit organisation. Although electronics manufacturers are known for renouncing responsibility for their electronic office supplies once beyond warranty, some are starting to operate customer recycling schemes as part of new environmental policies. Dell, for instance, will pick up disused computer hardware and ship it to an appropriate recycling centre. At such centres, the items are dismantled and sorted according to type or material. Materials such as metals are then reused to make new products whilst non-recyclable substances are disposed of in a green manner. Hewlett Packard operates a similar scheme and claim to have recycled over 74 million kilograms of electronics during 2005. If the manufacturer return option is not available then there is the option of paying professional e-waste services to provide a similar facility. Even in such a new service sector as e-waste management there are cowboys operating, so it’s important to check whether the company complies with WEEE legislation and can provide details regarding their Waste Carriers License. 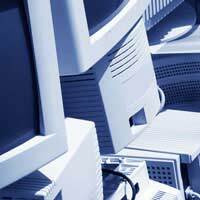 A good place to start is Waste Online’s website which provides a list of UK computer recycling and refurbishing companies by region. A more cost-effective option is to donate your electronics to a charitable organisation either for them to reuse or dismantle and recycle. The recipients are not expected to pay for the equipment, or at least not very much. These schemes can aid local community groups or people in developing countries. Before donating electronics as part of such a programme it is important to first make sure that any data is removed – hard drives should be reformatted for example. It is also vital to check whether equipment given for reuse is taken on by an organisation that has its own environment policy for e-waste disposal. In the British Isles there are now over fifty non-profit organisations that collect, refurbish and redistribute computer equipment for the benefit of needy concerns around the world. OFFERS/Ex-IT is a reuse and recycling project that aids students, low income citizens and small start-up businesses by giving them access to cheap IT equipment. Another respected group is Computer Aid International, which distributes refurbished PCs all across the globe. I search this website on opera mini. Because I create a seminar on environment about e-waste. I tell that website thank you because you give me the information. thank you very much! You're welcome - we're glad you found the information useful. I search this website on opera mini . Because i create a seminar on environment about e-waste. i tell that website thank you because you give me the information. thank you very much!